Each year, in February, The Island Hotel‘s Palm Terrace restaurant transforms its private room into a treasure trove of chocolate magnificence to celebrate Valentine’s Day. This year, the hotel’s Executive Pastry Chef, Andy de la Cruz, has outdone himself by creating a wonderland of delightful treats set within a modern and chic environment perfect for the new year. 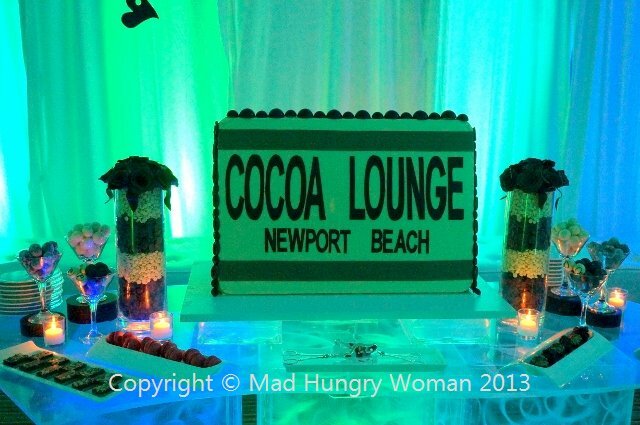 Cocoa Lounge, as it is called, opens tomorrow, February 1st and runs until the 17th, every evening between 6pm and 10pm. You can either dine at Palm Terrace and finish off at Cocoa Lounge for $12/person or partake at Cocoa Lounge only for $18/person. 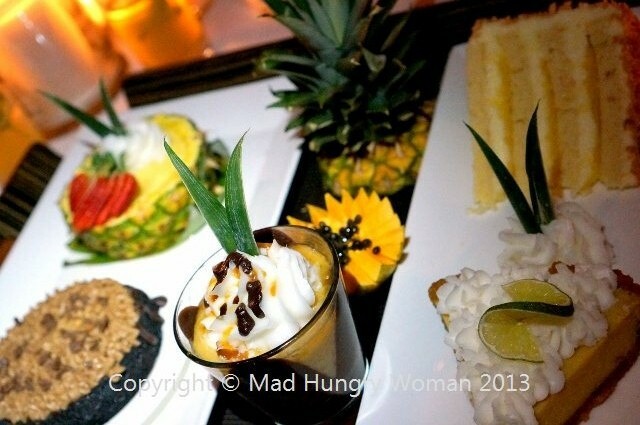 As you all know, I don’t have a sweet palate and in previous years, I have attended previews of Cocoa Lounge, written about it based on my friends’ reactions on the various desserts. This year, I’m happy to say, I sampled everything on display and was pleasantly surprised at how much I enjoyed some of the items. Apart from the tidbits of sweets on offer, there will also be an ice cream station where hand-dipped ice cream bars will be created as you order them. 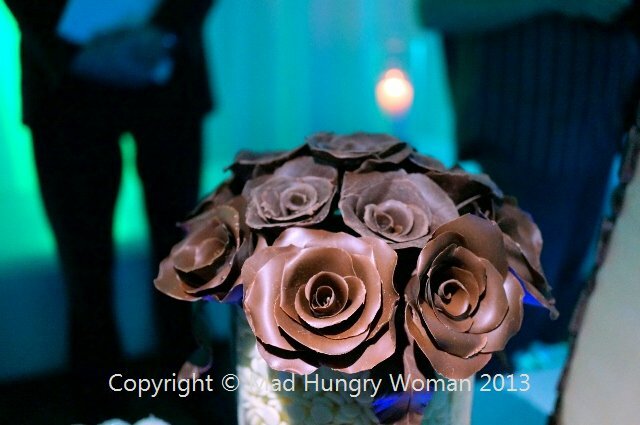 Chocolates and other edibles such as chocolate roses are also on display. 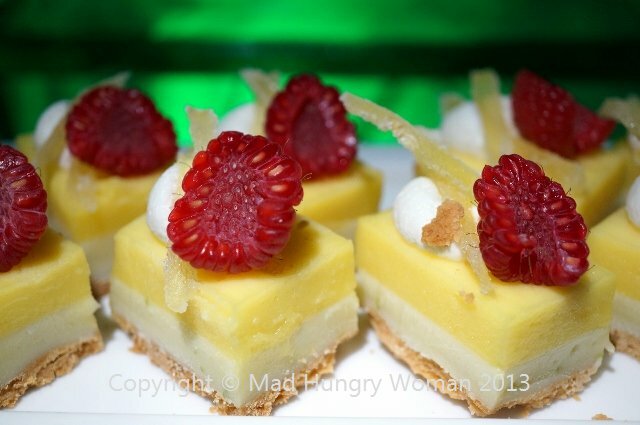 Here are some of my favorites of the night: white chocolate citrus bars with Andy’s signature lemon curd which I so adore. Perfect amount of tartness in a paired with white chocolate and topped with crystallized ginger and surprisingly, not too much sweetness. 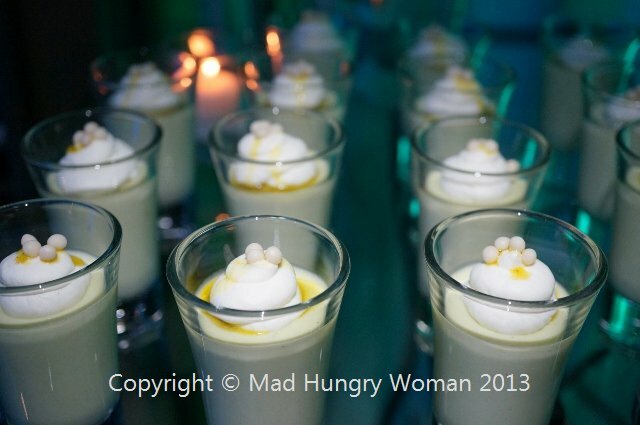 I love panna cotta and these pistachio white chocolate panna cotta were really light and not overly sweet. Chocolate banana savarins with Vienese bright yellow mousse and milk chocolate ganache were pleasant as well even though I normally do not like milk chocolate. 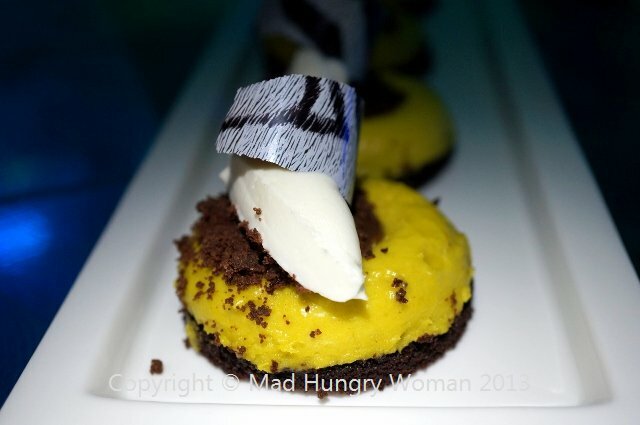 I especially enjoyed the deep dark chocolate tart with passionfruit cream. 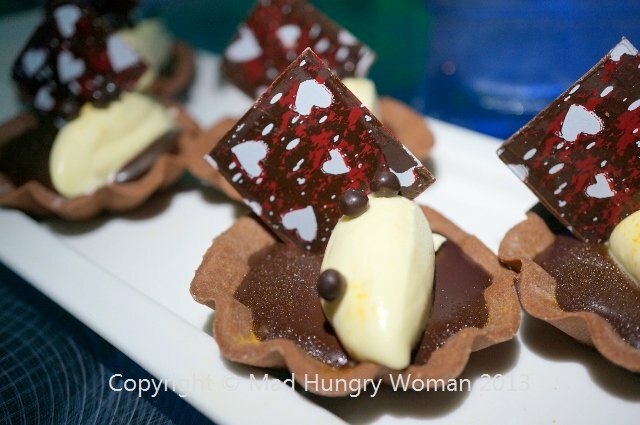 The passionfruit cream lent a surprising tart finish to the rich dark glossy ganache within the tart. 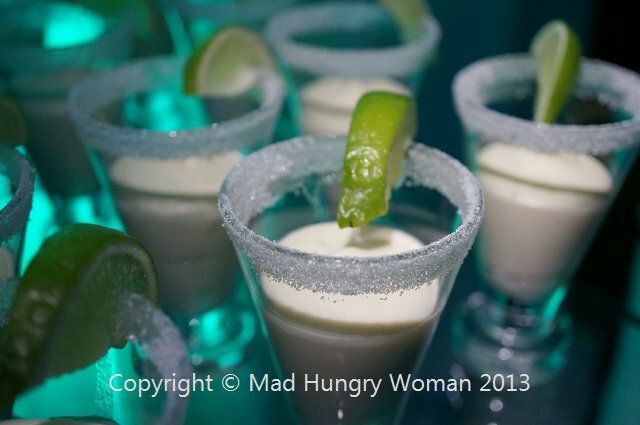 If you are a fan of white chocolate, white chocolate margarita mousse with tequila, grand marnier and lime zest will definitely please. 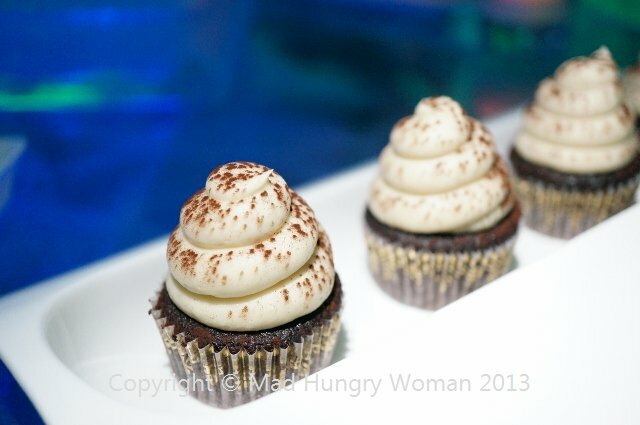 I didn’t get to try the Irish Car Bomb cupcakes with Guinness chocolate cake, Irish whiskey ganache and Bailey’s icing, but they are there if you want them. 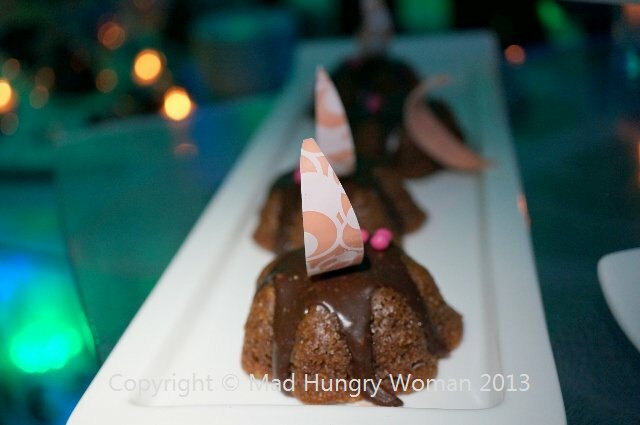 The chocolate honey cake were super cute baked in baby bundt molds and glazed with a chocolate honey sauce. So many more items are on offer and you will experience between 20 to 25 each night. For $50 per person excluding tax and gratuity, you can enjoy Cocoa Lounge with your choice of two drinks, wine, champagne or port or a flight of three 2-oz tastings of wine, champagne or port. This year, The Island Hotel has once again generously donated a Cocoa Lounge experience for two to one of my readers to win. This is a once in a year lifetime and not to be missed. Leave me a comment with your FULL name telling me who you will be bringing with you if you win and why. Entries close on Sunday, 3rd. Winner announced Monday! Good Luck! Drove down to San Diego and was lucky enough to catch the tail end of Restaurant Week last week. 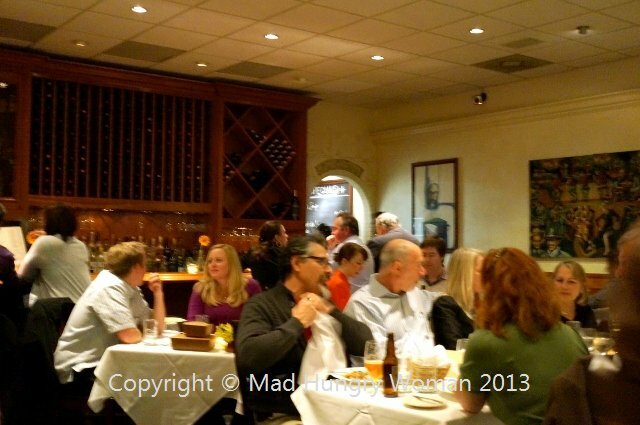 We visited Vincent’s in Escondido and my friends and I were pleasantly pleased to find a warm, cozy, bustling dining room. The regular menu was also available but we were here for the $30 prix fixe Restaurant Week menu consisting of three choices for appetizer, entree and dessert. To make it easy, we just went ahead and ordered everything so we could get a feel of what the restaurant had to offer. I was happy to see that the items are all available on the regular menu — really hate restaurants which make up an entirely different menu for restaurant week. This way, if you wanted to return, you’d be able to enjoy the dishes again. 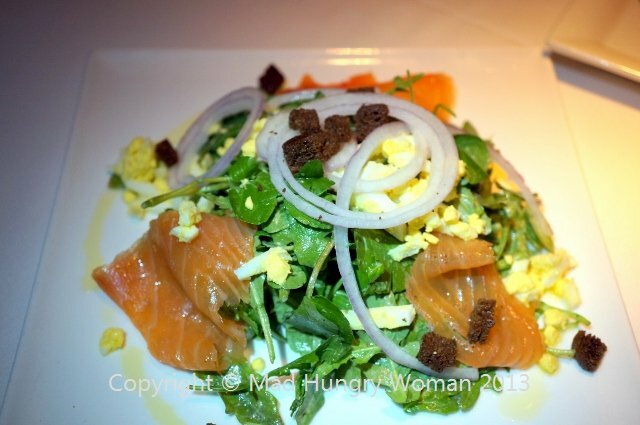 Smoked Salmon and Watercress Salad was a nice refreshing start, not overly dressed with the lemon-caper vinaigrette and served with beautiful smoked salmon and thinly sliced red onions. Chopped hard boiled eggs accompanied and the pumpernickel croutons were very nice. One of my dining companions is always making faces whenever I ask him to try lentil soup. The French Lentil Soup here was seriously flavorful and guess what? My friend loved it! 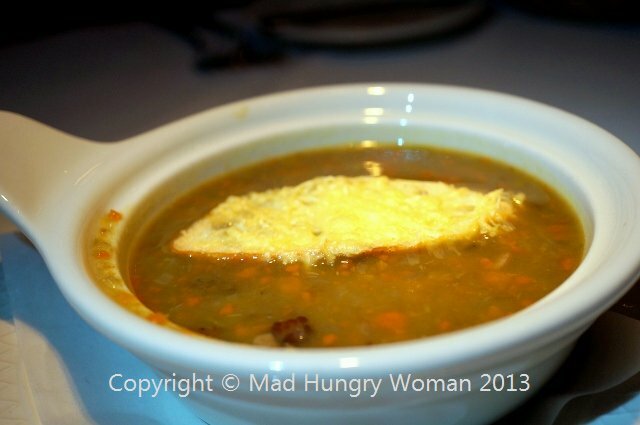 Topped with a parmesan garlic crouton, this is a soup I would like a big bowl of. Absolutely DELICIOUS! What really surprised me was the Braised Pork Belly. 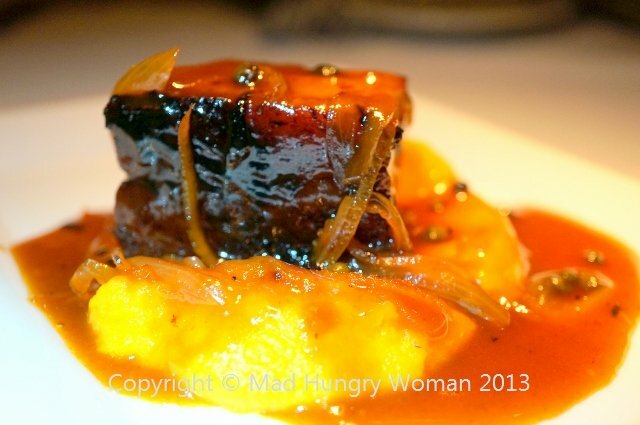 Everyone knows it takes a seriously outstanding pork belly dish for me to like it. I’m just not very fond of this cut because if not executed perfectly, the lean part of the meat is tough and the fat disgustingly fatty if not rendered properly. After one mouthful, I was sold! Unctuous and quite lovely. I couldn’t stop eating the puree of butternut squash it was served over. The sweetness was so well paired with the green peppercorn glaze drizzled over. 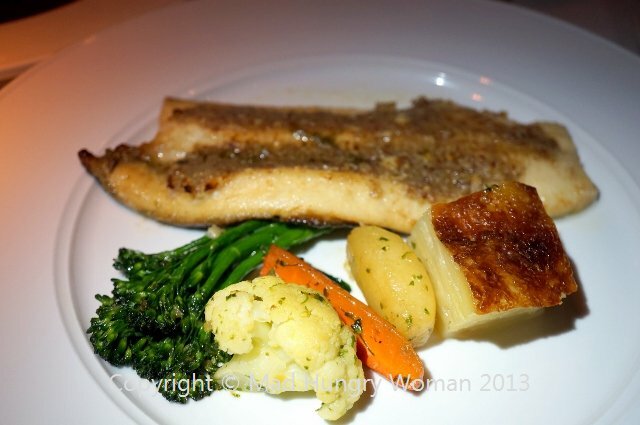 Entrees were next and Pecan-Crusted Rainbow Trout with Parsley Brown Butter Sauce was not my favorite. Idaho farm raised rainbow trout seasoned with pecans and pan sauteed did not possess a crispy crust as I had imagined. 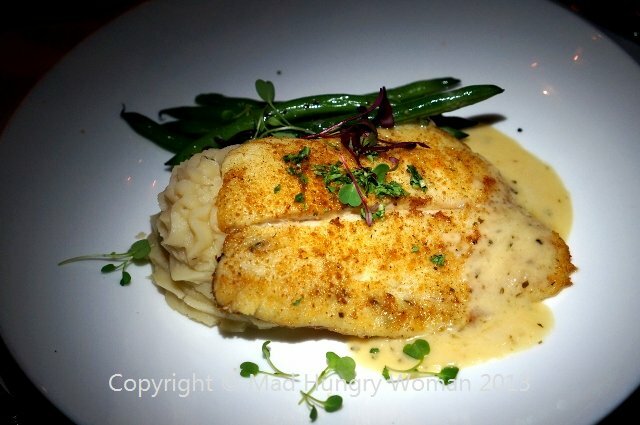 The pecan topping was a tad mushy, however, the fish was moist and flaky. The potato gratin was delicious, as was the medley of seasonal vegetables. I’m not a huge pork fan so I was skeptical about Pork Chop Charcuterie. 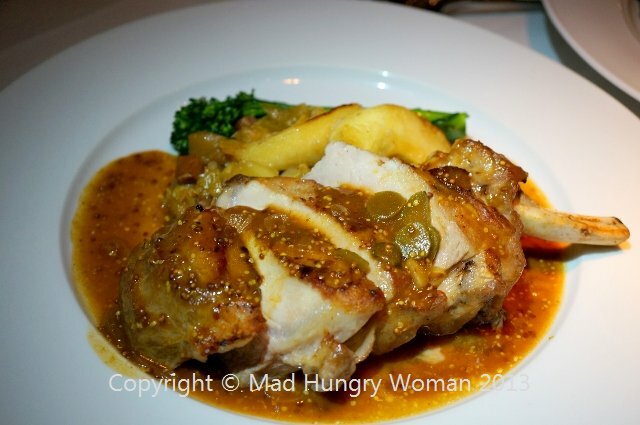 A pan roasted Kurabuta pork chop was a little underseasoned and slightly overcooked. However, the braised cabbage and sauteed apples were great accompaniments eaten together with the pork. The charcuterie sauce prepared with veal stock, herbs, Dijon and diced cornichons was really awesome and I wanted more of it for the bland pork. 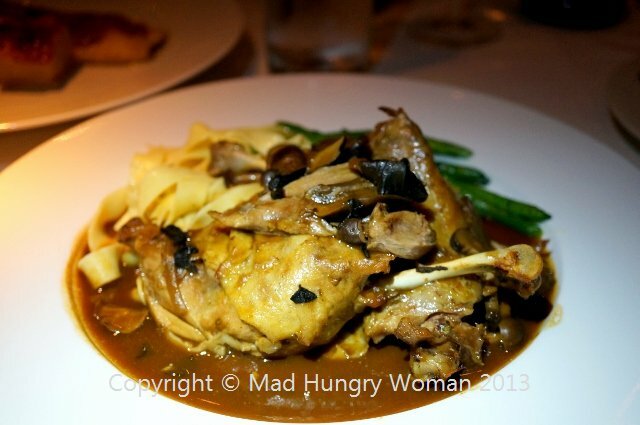 Everyone agreed, Duck Confit with Wild Mushroom Cognac Sauce was the definitely winner. Maple Leaf duck legs are simmered with garlic and herbs, fork tender and so rich on the palate. The house made wide noodles were the perfect accoutrement for this dish soaked in the wonderful wild mushroom cognac sauce. I would totally come back for this! So good! By the time we got to dessert, they had run out of two of the offerings, so they presented us with alternatives. 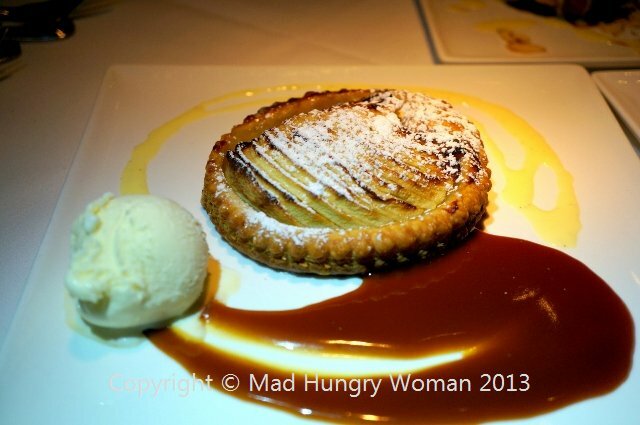 Apple Tart served with vanilla ice cream was one of those. I’m not a fan of apples, but this worked really well for me. The pastry was crispy while the apples were soft enough but still retained some bite to it. Really great! 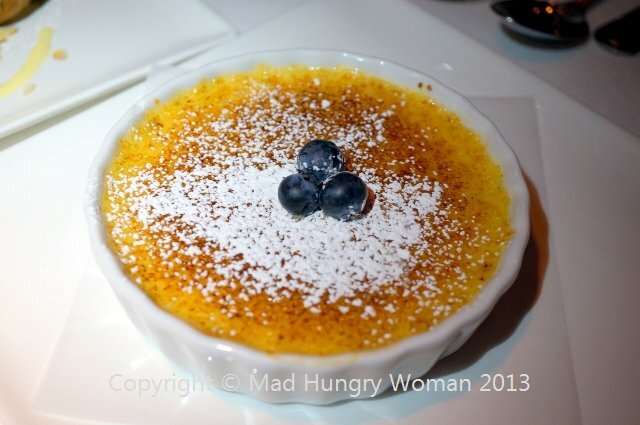 Creme Brulee was disappointing. The creme part was too dense and overly sweet. We didn’t enjoy this much. However, we saved the best for last. Hazelnut Paris-Brest pate-a-chou filled with hazelnut praline cream was absolutely stunning, just the perfect mouthful bite after bite. I’m not a dessert fan and I was in love with this. 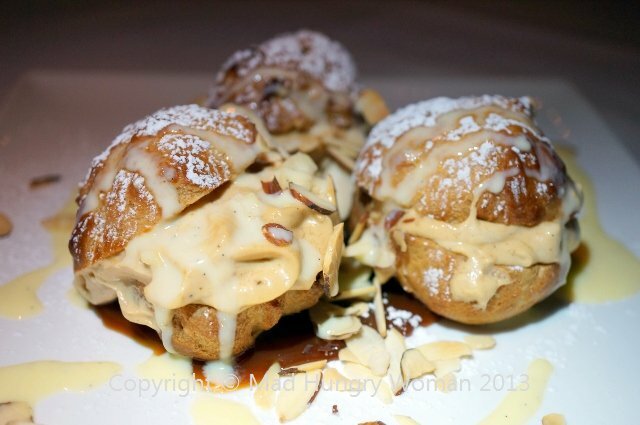 A little puff pastry, a cream puff if you will, is stuffed with the hazelnut praline cream — so soft and tantalizing! I would never have found Vincent’s had it not been my friend who heard about it on the radio one morning. I’m so glad we took a chance on visiting. This is one of those restaurants which truly utilized restaurant week to its fullest to showcase their menu items and it worked well to their advantage. Bravo! 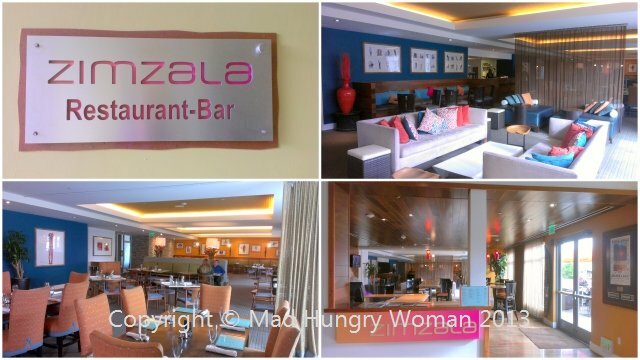 The last time I was at Zimzala it was for a big party and the only thing I remembered was what a nice space it was in and how modern and chic it looked. Recently, I returned with friends for brunch and was happy to find that it was still as nice as I remembered it to be. The restaurant is located inside the Shorebreak Hotel in Huntington Beach. They are dog-friendly so if you have a pet you want to bring along, they allow that on their patio. The thing which I didn’t like was if you park in the structure, they don’t validate parking. Alternatively, they have valet parking but I’m not sure how much that costs. We were there around 10am, but even on Sundays, they only offer breakfast at that time. The lunch menu doesn’t start until 11am. They were nice enough to oblige us with one lunch menu item between the six of us since the others were perfectly happy with what’s offered for breakfast. 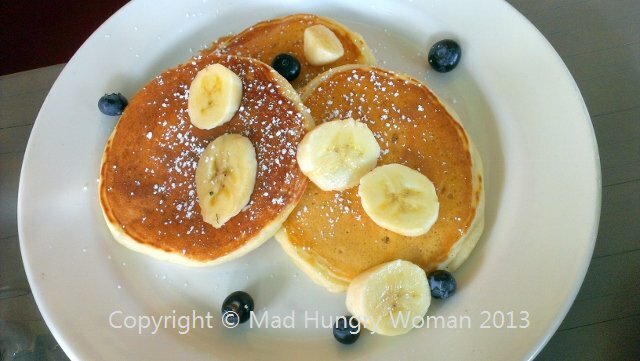 The kid at the table ordered the Blueberry Pancakes ($6.50 kid’s portion). I didn’t taste it since there wasn’t much on his plate to begin with. It must have been good because he had devoured it before the rest of us were half way through. I’m not a fan of omelettes, but California Omelette ($12) was rather tasty. 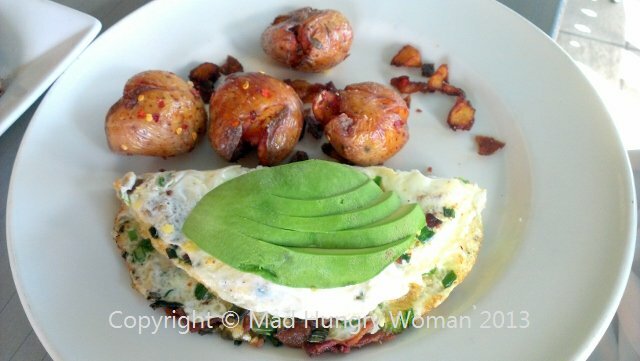 Hass avocado, applewood smoked bacon, scallions and monterey jack cheese made it really flavorful and the omelette was fluffy. The accompanying Yukon breakfast potatoes were also surprisingly good — and I’m not a fan of potatoes either. I tasted my friend’s Huevos Rancheros ($11) — two eggs any style, pinto beans, corn tortillas, tomatillo salsa verde, sour cream, monterey jack cheese and Hass avocado. 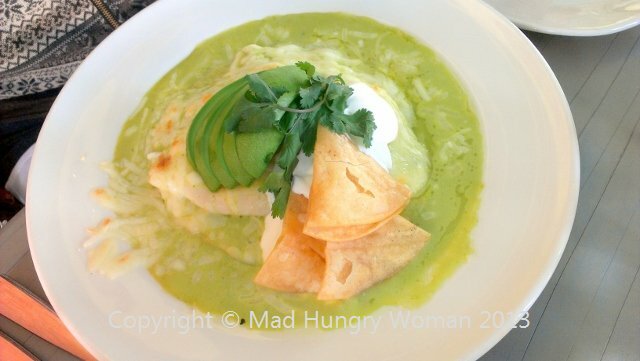 I don’t always like tomatillo sauce, but the one here was respectable and the hit to this dish! Duck Confit Quesadilla ($12) was the least favorite of all the dishes tried. 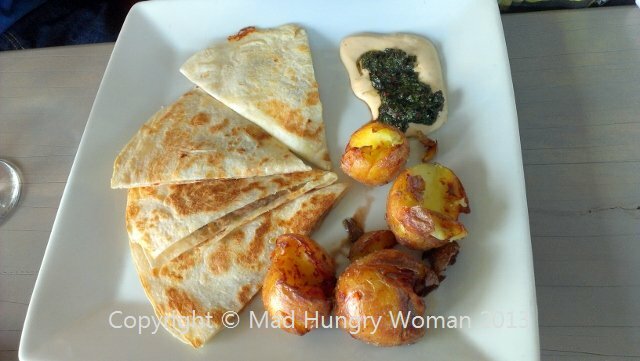 Laurel Channel goat cheese, chipotle creme, pomegranate chimichurri was a strange combination for the quesadilla. The goat cheese over-powered the duck confit. In fact, I couldn’t taste the duck confit at all, just goat cheese. What a waste of duck confit. Biscuit & Gravy ($10) was a hit and miss. 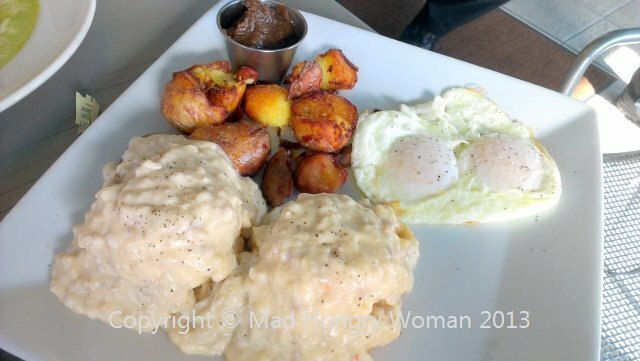 The housemade buttermilk biscuits were good, but the sausage gravy was tasteless. Fig apple butter was really tasty but couldn’t figure out what we were supposed to be eating this with. It also comes with two eggs any style and Yukon breakfast potatoes. 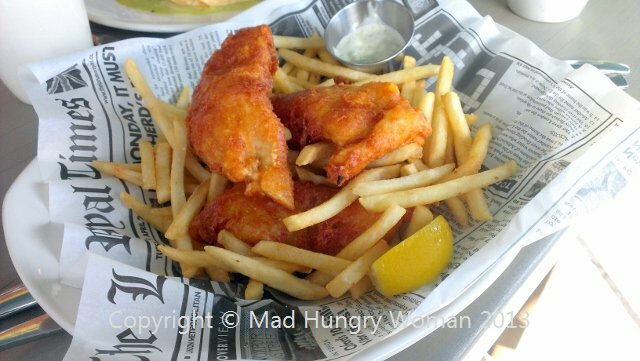 My favorite item of the whole meal was the Fish and Chips ($12). Stone IPA beer battered haddock was moist and flaky. The fish was very fresh and very well executed. The smoked onion tartare sauce was devoid of any smoky or oniony taste but still good. Accompanying French fries were also quite good. 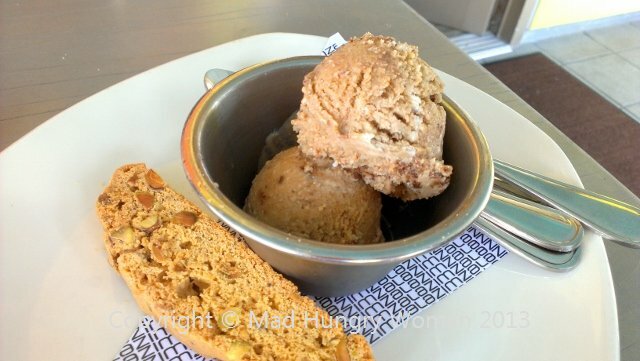 We ended the meal with Fig, honey, balsamic, ricotta ice cream. 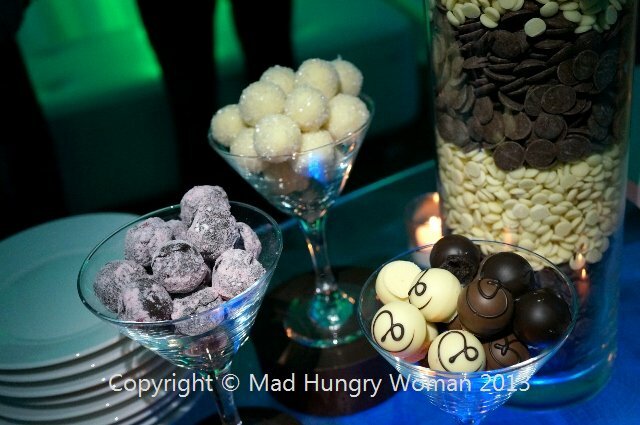 The flavors were great but unfortunately the texture was grainy and icy. The biscotti served alongside was quite nice. In summary, the meal itself was a hit and miss depending on what you ordered. By the look of it, lunch menu items probably fare better than the breakfast items. Still, the space is nice and the fact that you can bring your four-legged friends is the best part of all. A few weeks ago, I was fortunate enough to be invited to participate in a collaboration with Sony. The Hidden Project as it is called, is a cross-country event which brings together people of various backgrounds, industries and talents to capture the “hidden” aspect of their respective cities. 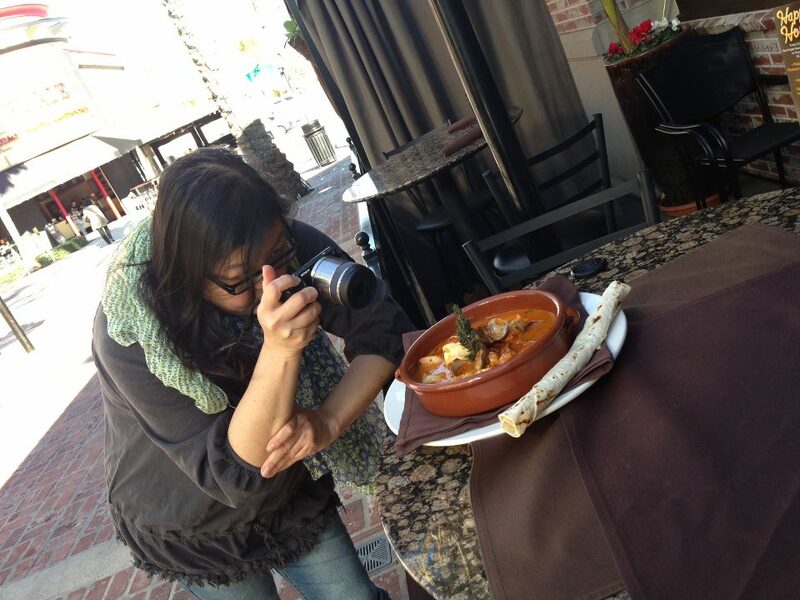 I represent #Sony714, Orange County, and as a food blogger, I’m taking you on a food journey of the “hidden” OC. Sony provided me with a brand new NEX-5R camera along with accessories including a telephoto lens and also, a macro lens. I, of course, use the macro lens most of the time to photograph everything I come across. Here’s a quick glimpse of me at “work” doing what I love most using the Sony NEX-5R! In the coming weeks I’ll have more info as to where and how you’ll be able to see the project in its entirety! Stay tuned! 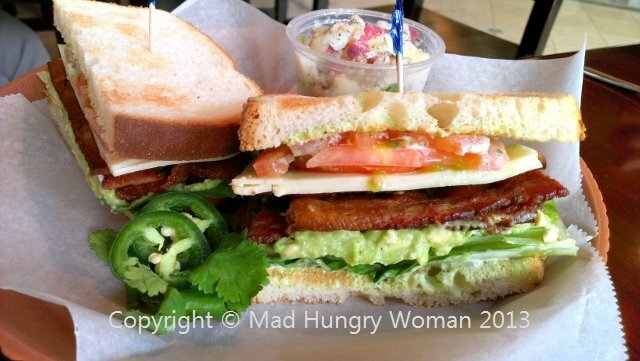 Back when I was writing for the OC Register, my friend Selene suggested we go check out Avocado Cafe in Newport Beach so I could write about it. The reason? Nothing other than the fact that I love avocados. 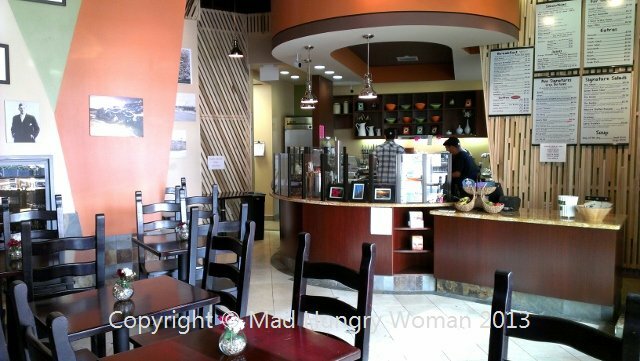 Fast forward several years and another friend tells me to check out Avocado Cafe in Irvine. At first it didn’t click, but then, it hit me…. ahhhh….. that place Selene wanted to go to has opened another location in Irvine. OH! We were SO there! So Selene, Anne Marie and I met at the cafe for breakfast one morning to check out the menu. We got there in time for breakfast but managed to check out some lunch time offerings as well. The menu is pretty cool. Everything has ….. well …. AVOCADOS! That is, except for the Acai Bowl ($8.75). This hunking bowl of goodness has apple juice, fresh fruit, crunchy hemp seed granola and bee hive honey. It was SO healthy I think my body was rebelling a bit. 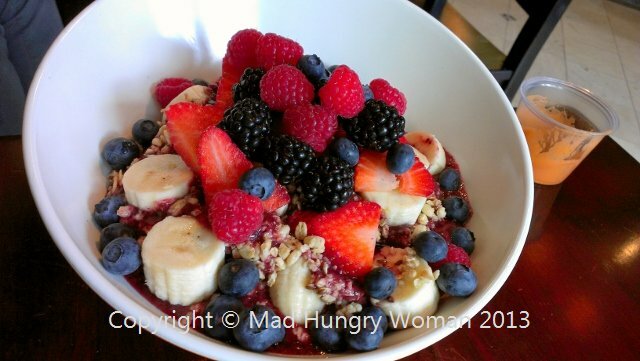 The flavors melded really well and the burst of fresh berries provided even more antioxidants in an already super healthy bowl. I’m glad to find something other than a breakfast burrito on the menu. 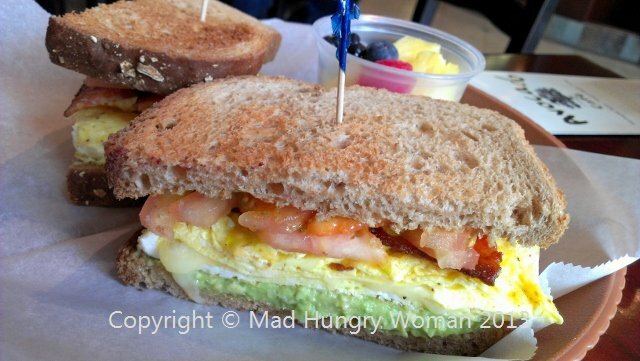 The Breakfast Sandwich ($6) consisted of eggs, bacon, avocado, tomato and cheese on your favorite bread. This is my kind of breakfast sandwich! Actually, a little more extravagant than what I would make for myself so that’s extra good news in my book! 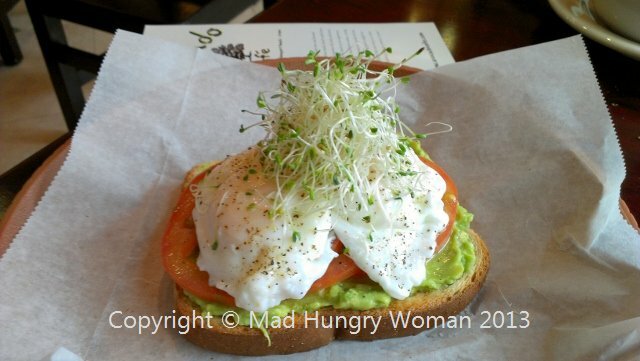 What visit to a restaurant serving avocados can be complete without tasting the Avocado Toast ($7) — crunchy toast topped with perfectly poach eggs, tomato, alfalfa sprouts and salted avocado. I went to college in Oregon and alfalfa sprouts are on EVERYTHING! I really missed that. It is so refreshing to see them used here. We also tried some sandwiches offered at lunch time. I’m a big fan of Cuban sandwiches and Gaston’s Cuban ($8.50) was very flavorful, even though it wasn’t traditional. 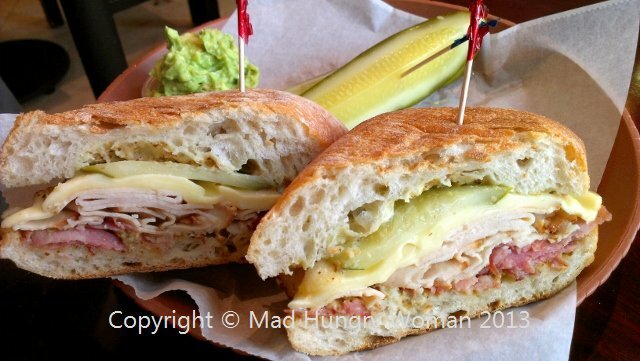 Oven roasted chicken, black forest ham, avocado, Swiss cheese, pickles, spicy mustard, signature wasabi mayo spread, served hot pressed on ciabatta bread was crisp on the outside giving it a nice crunch, but possessed all the flavors of a Cuban and was not the least bit greasy! 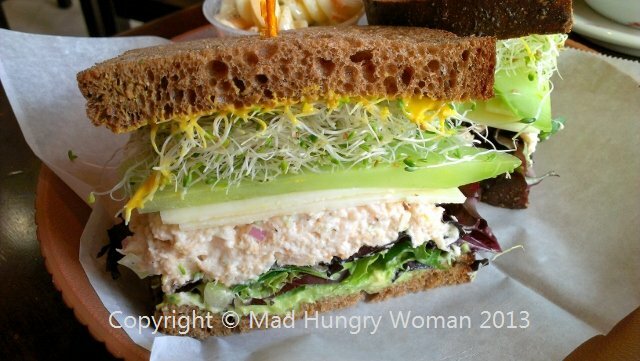 The Tower 9 ($8.50) is home made chicken salad, avocado, white cheddar, alfalfa sprouts, cucumbers, tomatoes, spring mix and yellow mustard sandwiched between two slices of squaw bread. Not only is this beautiful, but it tastes delicious too! I like the ratio of chicken salad and condiments — neither overpowered the other. My favorite has got to be Joe’s BLTA ($7.75). Avocado, applewood smoked bacon, romaine lettuce, tomato, Jack cheese and jalapeno ranch spread are all layered onto white bread and fresh jalapeno slices served on the side. I loved the kick and stuffed the jalapenos into my sandwich as I’m eating it. A spicy kick I so loved!! Right now, I have a $25 gift certificate from Avocado Cafe to give away for one of my readers to go try this cool place out for him or herself. Leave me a comment with your FULL name — don’t forget your FULL name people or your name won’t be entered — for a chance to win. Entries close on Friday 25th. Good Luck! I was in charge of organizing dinner for my friend’s birthday a few days ago. She didn’t know where to go and after several suggestions, I said “let’s just go to Tommy Bahama’s Bar & Grille“. I’ve always loved this place because I love Chef Jacqueline Nabong, but besides the food, the staff are simply amazing! I’ve always experienced outstanding service here. On the evening of our visit, the staff created a space complete with balloons for my friend who was just expecting dinner out with some girlfriends, but instead, was made to feel like a princess. We started with some cocktails. Included are Leap of Faith, a Tanteo Jalapeno Tequila with grapefruit, agave nectar and lime ($11.50) which was my drink. 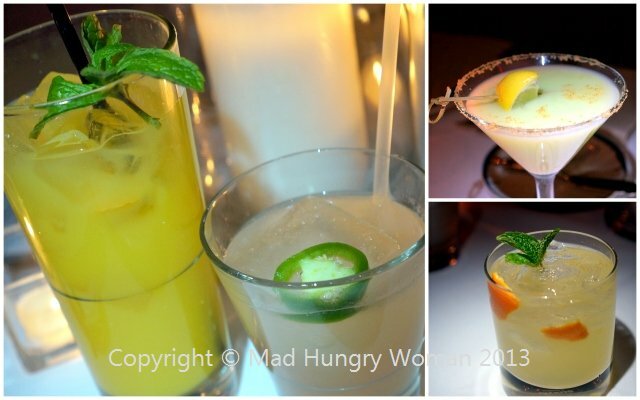 Be My Clementine ($12), on the special menu was dangerous because it was so easy to drink. Muddled Clementines, Grey Goose L’Orange, Cointreau, lemon and sparkling wine made this everyone’s favorite of the night. The restaurant is doing a special crab menu until the end of the month so I highly suggest going in and partaking in this. There will also be a few items from this menu featured on the menu during Valentine’s weekend as well. We got some Crab Tacos ($9.50/2pc) to share. 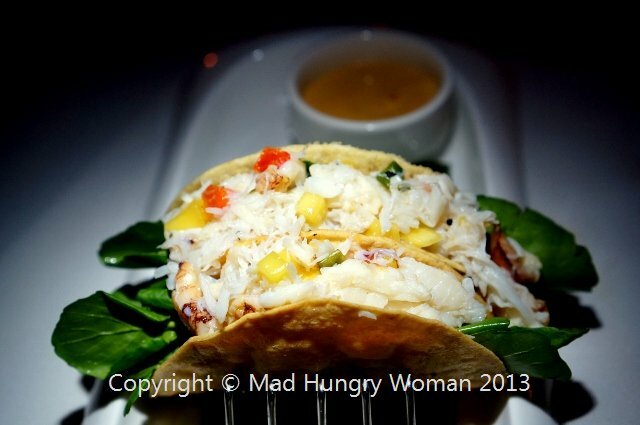 Crispy corn tortillas were filled with watercress, avocado cream, mango salsa, chipotle aioli, and topped with a heaping amount of sweet crab meat. SO GOOD! Everyone wanted the Crab Bisque ($9.50/$6.50) but I suggested we ask for a sampling in espresso cups because it was a rich soup and I didn’t want to fill up. 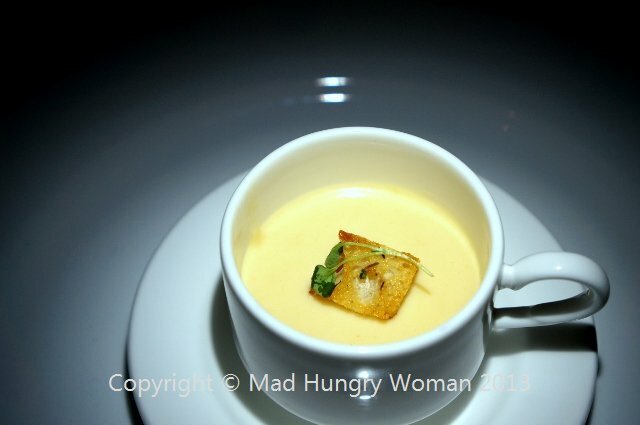 This luscious bisque contained lump blue crab, sherry and cream — so decadently delicious it silenced the room. When every last drop was in our tummies, the words out of everyone’s mouth was how divine it was. Days later, they are still talking about it. 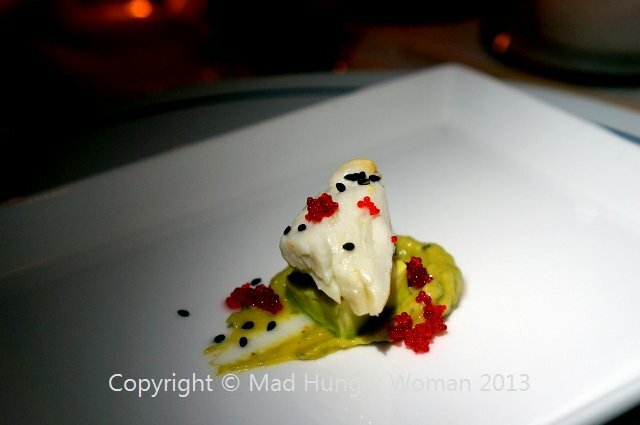 Before our entrees arrived, Chef Jackie sent out an amuse bouche of a piece of succulent crabmeat on top of avocado and sprinkled with tobiko (flying fish eggs). A single mouthful experience, it was a teaser which made us crave for more. Wagyu New York Steak & Jumbo Prawns ($35) a surf and turf if you will, served with, smoked bacon Brussel sprouts. 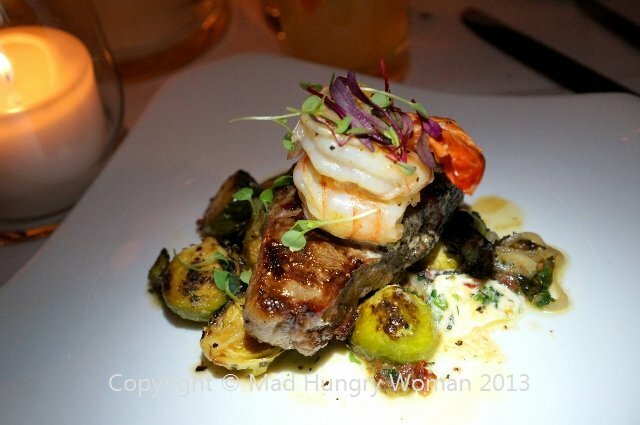 The meat was nicely seared and the prawns, succulent and flavorful. We couldn’t go without ordering something off the crab menu. 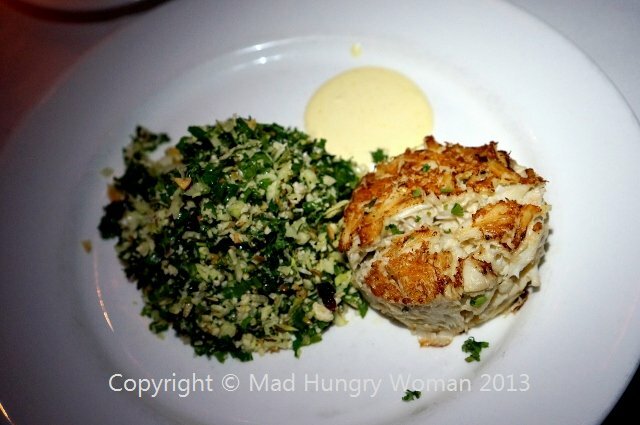 Blue Lump Crab Cake ($29) was a hefty portion. I’m always impressed by how much food you get here. The crab cake was perfectly textured and there isn’t any fillers in there so I could really taste every morsel of crab meat. Cranberry nut and cauliflower kale slaw is refreshing and makes this a pretty low carb entree. I don’t normally like halibut because when overcooked, it is horrible. I should have known that Chef Nabong would prepare it perfectly — yeah, stupid me — so when I tasted the Peri Peri Dusted Halibut ($33.50), which one of the gals ordered, I regretted not ordering it myself. The Pinot Grigio beurre blanc was luxurious yet light. and the accompanying fingerling potatoes and brown sugar glazed rainbow carrots were nice hearty sides. I was in the mood for seafood so Thai Shrimp and Scallops ($25.50) immediately caught my eye. 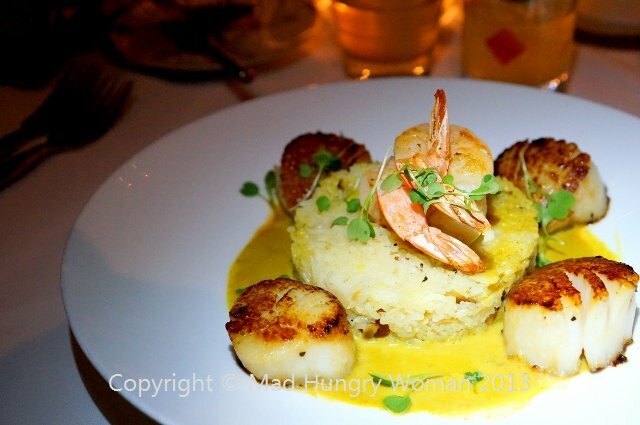 Perfectly seared scallops and beautiful shrimp with a good snap were so tasty in the mild coconut curry broth. I wanted more sauce to eat with the rice, but just as well because I was so stuffed I couldn’t finish the rice on my plate. 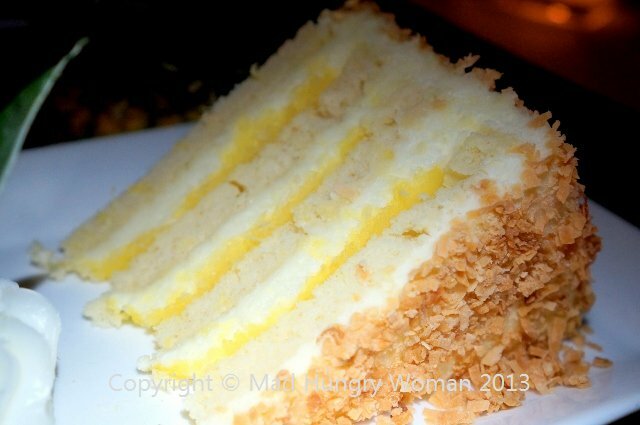 ….. however, since we were celebrating a birthday, Pina Colada Cake ($10/$6) was in order. Vanilla cake, drizzled with Myers dark rum, layered with diced pineapple and white chocolate mousse coated with toasted coconut is light and oh so tropical. 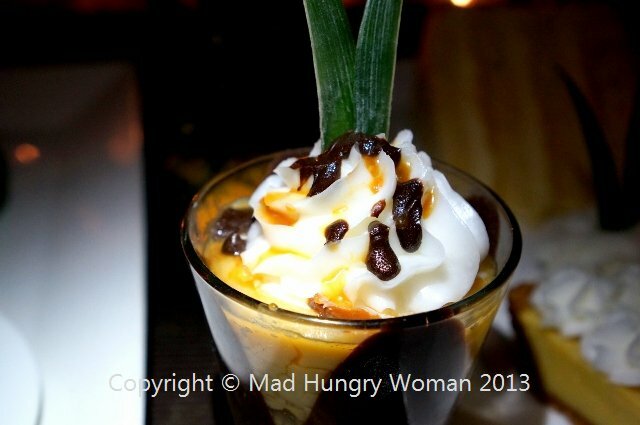 We also ordered the Butterscotch Pudding ($6) with chocolate ganache, scratch caramel and white chocolate mousse is a chocolate lover’s dream. I only managed a taste but it was devoured quickly by the others. I can’t remember the last time a birthday was celebrated SO perfectly! 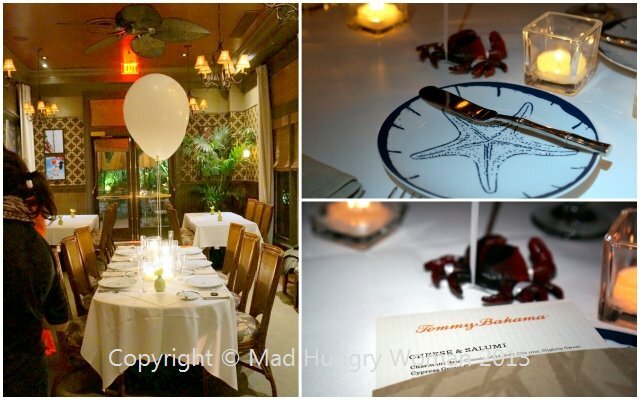 Our server, Em, was knowledgeable, friendly and the perfect person to guide us along towards such memorable meal. It’s only January people, there’s plenty of time for others to wow me before the year’s out, but right now, I’m not sure what can top this incredible night.